Shine & Pretty (USA) Corporation 456 Constitution Avenue, Camarillo, CA, is an integrated contract manufacturer of personal care products including creams and lotions and styling gel products. Located at 456 Constitution Avenue in Camarillo, CA, they have a 30,000 square foot compounding area utilizing reversible axial flow rotor/stator mixers in an extremely advantageous processing method personally developed by the founder of Shine & Pretty Mr. Ed Sheu. Stainless steel jacketed process mixing vessels combine an anchor style scraped surface agitator with the ARDE Barinco Reversible Homogenizing mixer. 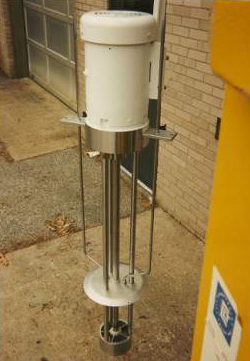 A new Model CJ-75-2 Reversible Homogenizer was recently commissioned in a 1,000 gallon mixing vessel that also contained a scraped surface anchor agitator. 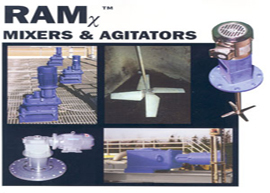 The scraper agitator rotates the batch while at the same time removing any viscous material from the walls of the process vessel. 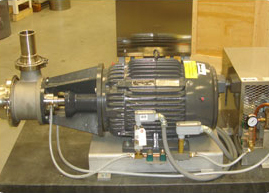 This is especially important during the transfer of heat via steam heating or water cooling. As stated above, a wide variety of different personal care products are compounded and packaged at the Shine & Pretty facility. 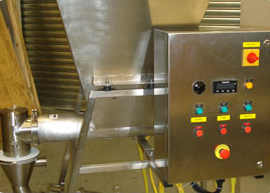 The ability to do a wide variety of different viscosity products that contain different components, both liquid and powders, in process vessels that can produce different batch sizes is at a premium for this facility that is extremely responsive to individual customer requirements. 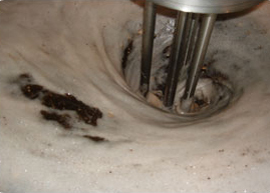 They have developed a process technique to produce a clear air bubble free gel utilizing the Reversible Homogenizer mixer through careful control of mixer flow direction and speed. Light powders such as carbomers are added to the batch while running the Reversible Homogenizer in the down-mode direction. The down-mode draws the floating solids off the surface and brings them into the high shear mixing head where they are dispersed. The powders can be added quickly since they are all being drawn into the mixing head and dispersed. The draw in time for a typical 1,000 gallon batch would be 5-8 minutes for 50 pounds of carbomer 941. Since the carbomer powders can be drawn in and wetted out quickly, there are no problems of excess shear. 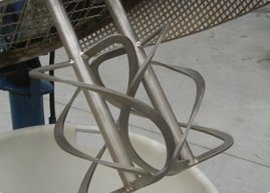 There is no appreciable shear damage to the carbomer polymer chains. After all of the powders are drawn in, the Reversible Homogenizer is switched to the up-mode and run at full speed for a very short time to fully homogenize the batch and polish out any agglomerates. Again, the mixing time is very short and the total amount of shear and energy that is added to the batch is low. At this point in the gel making process, the interesting deaeration process begins. The Reversible Homogenizer is set in the up pumping mode direction. The baffle plate is located directly at the surface of the liquid at rest. The operator adjusts the speed of the homogenizer by watching the flow emanating in 360 degrees from the circular baffle plate. 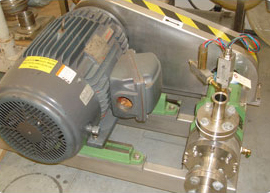 The RPM is adjusted to control the flow into a smooth laminar non splashing regime. Entrained air bubbles are drawn up from the bottom of the gel batch and distributed gently at the top surface. After approximately 30 minutes of atmospheric pressure deaeration, the batch is fully deaerated. Following deaeration, triethanolamine is added to increase the pH and neutralize the carbomer mixture. This allows the long change polymers to uncoil. Viscosity increases significantly at this point. Subsequently in the process, the Reversible Homogenizer is never run at high speed since the carbomer chains, thus activated, are now susceptible to shear damage. The homogenizer can be run at intermediate speeds or low speeds and the anchor can continue to gently blend in any additional ingredients or fragrances to finish the batch. Through careful atmospheric deaeration, Shine & Pretty developed a process to produce deaerated gels without the use of vacuum processing vessels or in-line vacuum deaeration devices. This ability gives the company a major advantage in the production of high quality gels and also fine grain creams and lotions. 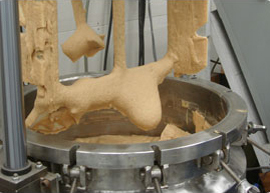 When producing an emulsion, stabilizers are often utilized in the water phase. The oil phase is then dispersed into the water phase. However, if the water phase contains entrained air, this can seriously ruin a stable emulsion. The Reversible Homogenizing mixer gives the Shine & Pretty the ability to quickly draw in and wet out powders without utilizing excess mixing time and without exerting too much shear. By reversing to the up-mode, very high velocity and high flow rates can be obtained for quick homogenization of the batch. By subsequently running the up-mode at an intermediate speed, entrained air can be drawn from the bottom of the vessel and distributed on the top surface. This step allows for the escape of entrained air without the use of vacuum.